As I write this week's update, I am in Niagara Falls, NY participating in the National Alliance for Medicaid in Education fall Conference. Some of you will be very familiar with this organization but many of you may not. I became involved with this group through John Hill, who is now their first executive director. When I first met John, he was at the Indiana Department of Education working with Medicaid at the state level. John is a long time faithful attendee of the CASE July Legislative Leadership summit. John always arranged meetings on our Hill day with OSEP, OSERS, and CMS leadership and CASE always had a contingent participating in those meetings with him. NAME led the campaign to get the parental consent once as opposed to every time. It was a partnership then and it continues to grow. NAME is really an organization of members at three levels, the local district special education director and related service providers, the state level special education and Medicaid directors, and the Medicaid support industry. During the conference, they had a panel of related service providers, with AOTA (Occupational Therapy), APTA (Physical Therapy), ASHA (Speech and Language Pathologists/Audiologists, and NASN (School Nurses) representatives discussing various issues. I will be on a panel that also includes our friend Nancy Reder from NASDSE (State Directors), Aaron Larimore (State Medicaid Directors) and John Hill. It is important at the national, state, and local level for us to be in partnerships and to actively collaborate with other stakeholders. If you participate in Medicaid services at your district, I hope you are a member of NAME! And even if you are not providing Medicaid services, this partnership is important. One of the growing fields and perhaps one of the answers to the SLP shortage is the area of telepractice/teletherapy. There were at least 2 90 minute sessions on this delivery model. 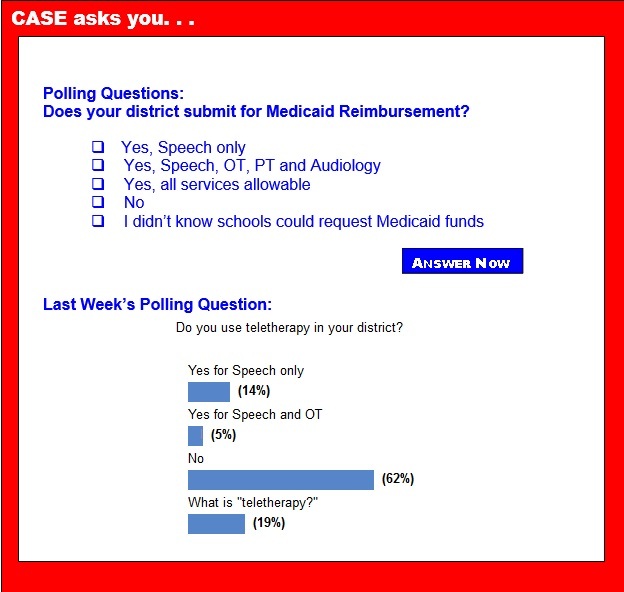 Last week the Poll was on teletherapy and there were over 20 percent of those who answered the poll who did not know what it was. ASHA has quite a bit of resources on this topic. If you have not gone to the ASHA website to check out the overview, resource, key issues, and, references, I would encourage you to do so. I would also love to hear from you on what questions/issues you would like CASE to explore for you on this area. We will continue to partner with other associations to bring to our members the best practices, best resources and best ideas possible! Speaking of best practices, resources and ideas, you are absolutely in luck! Professional Development Chair, Will Gordillo has put together an amazing program for our CASE members for the 25th Annual CASE fall conference! Our three keynotes will definitely inspire you but they also will provide you with a wealth of practical tools you can use in your everyday work ASAP. Drs. Stevan Kukic, Randy Sprick, and Frances Stetson will totally blow you away with the quality of their presentations! I have heard each of these 3 professionals on many occasions and I have always left with new ideas, new tools and a feeling that the job I do is important and necessary! The 30+ breakout sessions are also full of practical, evidenced based information. Click Here for a list of the breakout sessions. If you want to learn what's new, connect with your colleagues from around the US and Canada, and experience some quality professional learning that is both inspirational and content laden, then join us in San Antonio Nov. 13-15! Registration is up at www.casecec.org. The Institute of Education Sciences, the research arm of the US Department of Education, has issued a request to the field for feedback on the work of its two research centers: the National Center for Special Education Research and the National Center for Education Research. IES intends to use the input it receives to help plan the future work of these research centers. The deadline for submitting comments to IES is Oct. 31. Two years ago, the Department of Homeland Security (DHS) began offering the opportunity for young people to request consideration for Deferred Action for Childhood Arrivals and obtain temporary relief from removal from the United States. Over 580,800 young people from all over the world have received DACA since 2012. Today, current and former students who requested DACA beginning in 2012 are now becoming able to request consideration for renewal of DACA. The Joseph P. Kennedy, Jr. Foundation is seeking exemplary professionals, and/or persons experiencing disability and/or family members of persons with intellectual or developmental disabilities who are currently working or volunteering in the field of inclusive services and supports for people with intellectual and developmental disabilities for an intensive one-year Public Policy Fellowship in Washington, D.C. Researchers have used brain scans to predict how young children learn to read, giving clinicians a possible tool to spot children with dyslexia and other reading difficulties before they experience reading challenges. Have you ever found yourself wishing that you could create a community of students who are self-motivated and persist with challenging tasks? Do you have a student that gives up after making one mistake? Why do some students give up so quickly? How do we encourage our adolescents who have undergone so many failures with math or reading? Carol Dweck, a leading researcher in the field of motivation, has posed there are two groups of people in the world: people with a "growth mindset" and those persons with a "fixed mindset." What's going on inside a dyslexic student's brain? There no such thing as a "normal brain." In fact, there's a lot of diversity in how different brains process information — a challenge for educators tasked with teaching a diverse group of learners. Dyslexia is a common variation that affects how kids read, but what's really going inside the brain of someone affected by it? Kelli Sandman-Hurley's TED-Ed video explains. The PARCC testing consortium decided Friday to make the speaking-and-listening section of its test optional for states for at least two years. The move came in a unanimous vote by the consortium's governing board. The decision means that PARCC's member states will allow districts to decide whether to administer the portion of the test that measures one particular set of skills in the Common Core State Standards: how well students absorb information by listening, and how well they communicate that knowledge orally. A federal lawmaker says he wants to level the playing field for parents involved in special education disputes with their child's school district. U.S. Sen. Tom Harkin, D-Iowa, is proposing new legislation that would ensure parents who successfully challenge a school district under the Individuals with Disabilities Education Act can recoup costs for psychologists, behavior specialists, physicians and other experts they engage in order to bring their case. As students' age they are verbally and physically bullied less but cyberbullied more, non-native English speakers are not bullied more often than native English speakers and bullying increases as students' transition from elementary to middle school. For dyslexic students, are smartphones easier to read than books? Matthew Schneps holds a Ph.D. in physics but his success came with a certain measure of challenge. In addition to being an astrophysicist, Schneps is also dyslexic, which means he joins approximately 15 percent of Americans in a struggle to read. "When I read, I find it's very hard for me to kind of mentally lock on to the words," Schneps said. One thing has helped, however — Schneps's smartphone, which helped him bridge the distance between his mind and the written word. But was the device just helpful to him? Or it could it be helpful to others? Do students learn more when their teachers work well together? Debates about how to improve educational outcomes for students often involve two camps — those who focus on the impact of in-school factors on student achievement and those who focus on out-of-school factors. There are many in-school factors discussed but improving the quality of individual teachers (or teachers' human capital) is almost always touted as the main strategy for school improvement. Social capital is malleable; policies can and do shape teachers' professional networks and how they function. For example, Gamoran, Gunter and Williams (2005) showed that sustained and coherent professional development can be used to create strong collegial ties (or social capital) among teachers. There have been some interesting developments recently in the education sector, especially imparting education in the K-12 levels. The beginning of 2014 saw major predictions being set for the way education will take shape in these times of rapid change and technology. As the 2014-2015 school year begins, we are seeing some of these predictions come true. Tech-driven teaching practices have stormed in and have been consolidated as key teaching tools for most states this year. Another major development has been more student-centric learning and responsibilities. As the national debate over the Common Core K-12 academic standards rages on, most of the states that originally adopted them are standing by the standards, though they're calling them something different. As students' age they are verbally and physically bullied less but cyberbullied more, non-native English speakers are not bullied more often than native English speakers and bullying increases as students' transition from elementary to middle school. Those are among the findings of a wide-ranging paper just released. A peek inside the brains of more than 750 children and teens reveals a key difference in brain architecture between those with attention deficit hyperactivity disorder and those without. Kids and teens with ADHD, a new study finds, lag behind others of the same age in how quickly their brains form connections within, and between, key brain networks. When parents in Colorado check state-mandated reports to see how their child's school is faring academically, they can also quickly learn if that school has a nurse, if it offers 30 minutes of daily physical activity for students, and if it has a school-based health center. Though school-level report cards typically feature information about standardized-test scores and student demographics, the Rocky Mountain State also requires schools to report a variety of other factors that affect students' health and wellness.